Funky Aardvark is a Community Interest Company based in Chester. 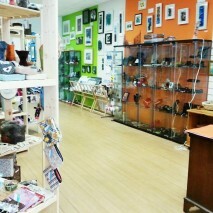 Its an artists hub spread across 2 premises. 51 or “Area 51″ is the makers space where the Attic Artists reside, meet and have access to wonderful equipment, including a lazer cutter, 3D printer and Kiln’s. Caroline has moved her workshop to the first floor at Area 51 and is now selling work at the wonderful new Funky Aardvark shop at 61 Bridge Street. Art & Craft for everyone, Funky Aardvark offer free tea and coffee and have amazing gallery spaces showing a great variety of exhibitions all year round. The shop has work from over 60 makers across many disciplines, Jewellery, Ceramics, Cards, Clothes, Photography, Paintings, Textiles. Its a great place to visit for unusual gifts or to relax and hang out, there’s also courses available, including pottery, felt making and life drawing! Art & Crafts for everyone!